Welcome! You've come to the right place: This is your go to free conference schedule of upcoming blog and influencer events for influencers, bloggers, brands and PR. The Mommy Blog Expert Master Blogging Conference Calendar, which includes direct links to blogging conferences in the U.S., Canada, and Europe, provides the most comprehensive free list of national and regional events for women bloggers and the brands targeting female demographics. Also included are conferences for dads and niche bloggers who are not parents. Constantly updated, this reference is a vital resource for bloggers, influencers, PR, agencies, and consumer brands seeking to interact via the industry's most desirable blogging and social media events. Compiled by MommyBlogExpert 's founder lifestyle influencer, blogger and social media strategist Janis Brett Elspas as a service to all professional blogging communities and to the brands targeting influencers both in the U.S. and abroad. As a lifestyle blogger myself, I am always glad to share opportunities for others who blog, both those of us with children and those without, to connect brands, consumer companies, and their agencies and representatives with bloggers and influencers online or in-person. For Influencers: Subscribe to MommyBlogExpert.com NOW to be among the first to know as more details are available for these conferences -- as well as to find out right away when NEW conferences are added to this valuable industry calendar. Also be sure to follow Mommy Blog Expert on Twitter, Facebook, Pinterest, Instagram and Google+ to stay updated on the latest conference news. For Conference Organizers: Add Your Blogging Conference or Event FREE to this MommyBlogExpert.com Calendar by emailing details to janis@janiselspas.com. A basic listing is always free with no further obligations. However, for a nominal consulting fee, I also offer other options such as extra promotion of your conference and affiliate advertising, so please email me to discuss. For PR & Brands: See sponsorship ops available as well as the many other ways we can work together to promote your brand during Blogging Conferences MommyBlogExpert attends on your behalf -- whether or not your company is officially affiliated with any of the events where you seek a presence. If you represent a relevant event that is a fit for this calendar, please email information directly to janis@janiselspas.com making sure to include Conference Calendar Post in subject line. 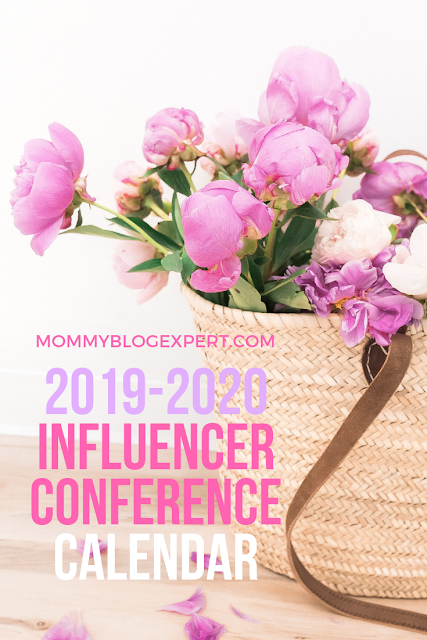 FTC Disclosure: MommyBlogExpert publishes this blog and influencer conference event calendar as a community service for influencers, bloggers, conferences, brands and PR. Except for Type-A Parent Conference, MBE is not receiving any payment or compensation associated with the listed conferences or sponsoring organizations involved. See complete FTC Disclosure information that appears at the bottom of MommyBlogExpert's main page and at the bottom of every individual post on this blog, including this one.